CosMedix Pomegranate Peel is a Level 1 superficial peel treatment – suitable for every skin type including sensitive and dry skin. No discomfort or burning. It’s normal to experience a mild tingle sensation for the first few minutes. Corrects a multitude of concerns in one treatment. Instantly brightens and smooth every complexion. This is ideal for anyone concerned with dull, lacklustre complexion post summer holiday. Effective treatment for brown marks called Hyperpigmentation. The look and feel of the skin is dependent upon having a normal structure that is similar to that of a brick wall. That way invaders are unable to penetrate and cells are protected against Ultra Violet Radiation from sunlight. The complex formulation of the CosMedix Pomegranate Peel treatment improves the size and shape of the bricks so they become more uniform. The quality of the mortar in-between is filled with a multitude of elements, including water binding actives, enzymes and antioxidants. Over the course of time, long after the treatment has been applied, this peel infusion remains effective at restoring a healthy skin structure because it contains the nutrients that help all cells thrive. 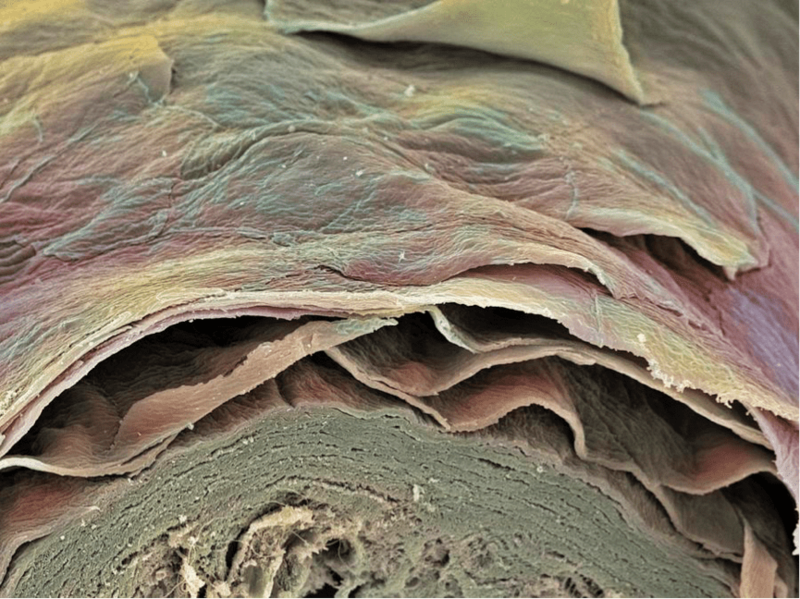 Microscopic Skin Layers captured using an electronic microscope. The skin layers appear to be exfoliating normally. In a healthy skin cells proliferate every twenty-eight days. The rate of renewal becomes slower and in a premature aged skin can be as much as one hundred and forty days. After kick-starting your conditioning programme with Blueberry Smoothie, the CosMedix Pomegranate Peel is the next natural progression. It contains double the amount of L-Lactic Acid (15%) plus additional resurfacing from enzymes that helps boost penetration and their strength. This can be particularly challenging when treating a Photodamaged skin that is affected by Glycation, a hardening of the elastin fibers. What Skin Types and Problems is the Treatment Most Suitable For? The CosMedix Pomegranate Peel can be used on all skin conditions but is most effective at treating hyperpigmented skin and is a more sophisticated solution than using traditional glycolic acid peels. As with all CosMedix peels, the CosMedix Pomegranate Peel is free-from Glycolic acid. L-lactic Acid has a larger molecule size and is Chirally Correct, cell receptor recognised. This is enables us to treat challenging skin issues, even for sensitive skin. Scientific research has long demonstrated that the key benefits are obtained from L-lactic because it Self-neutralises and induces the synthesis of the most important component of the cell membrane – the ceramides – re-enforcing the epidermal barrier function. Secondly a study demonstrated that lactic acid is the most effective therapeutic agent to treat Melasma. Unlike glycolic acid, L-Lactic Acid does not generate irritation and a far more gentle approach to skin restoration. Helping improve the level of tolerance and making it a safer option for treating darker skin from Fitzpatrick I – IV and sensitive skin. What ingredients are in CosMedix Pomegranate Peel? 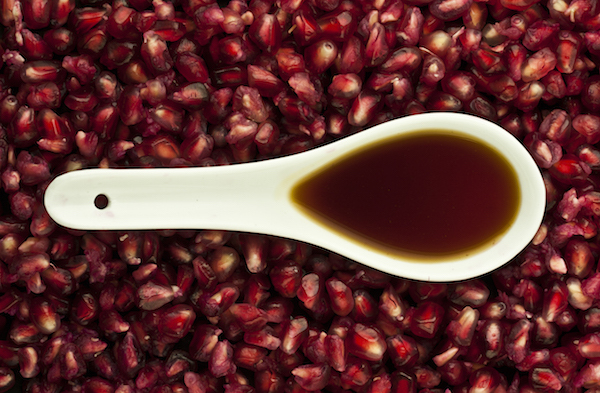 The CosMedix Pomegranate Peel contains 15% L-Lactic Acid plus papaya enzymes for enhanced exfoliation. This treatment also contains a complex blend of bio-available antioxidants from pomegranate seed oil, powerful D-Glucuronic Acid, Epigallocatechin Gallate (or EGCG from Green Tea), Astaxanthin and Resveratrol. Antioxidants are effective for reducing oxidative stress from environmental exposure that leads to premature ageing and saggy skin. The CosMedix Pomegranate Peel is boosted to a higher strength treatment combining additional L-Mandelic and L-Tartaric Acids plus Vitamin C mixing crystals. This treatment is higher strength, so it’s advisable to have as part of a series, once the skin is conditioned with the Pomegranate Peel. Thanks to additional AHA’s and Vitamin C the Pomegranate Brightening Peel is more effective at treating hyperpigmentation. Thanks to the tyrosinase inhibiting properties of L-Ascrorbic Acid. Because CosMedix Pomegranate Peel is a superficial treatment, this can be given as often as once every two weeks. Does this treatment require any prior home care preparation using a skin kit? No, this is a treatment that can be performed without prep. As with all of our treatments, there is a post-peel treatment plan, however this will vary from client-to-client and will be discussed with your certified Professional. CosMedix Pomegranate Peel is suitable for all skin types and conditions. It can also be used with women that are pregnant and breast feeding. The only people who couldn’t have this treatment done immediately are those currently taking Isotretinoin (within last 6 months). If you’re a Beauty Therapist, Nurse or Doctor and based in the UK and would like to become certified in CosMedix biodynamic skin peels, contact us to learn more about the Medico Beauty Institute skin peel training courses by emailing us at training@medicobeauty.com. Want to book a Pomegranate facial peel. If you have any questions about this treatment please contact us at order@medicobeauty.com. Which one of your products is ideal for post-inflammatory hyperpigmentation?